Home » News » NYCB Dancers at Saratoga City Ballet! NYCB Dancers at Saratoga City Ballet! 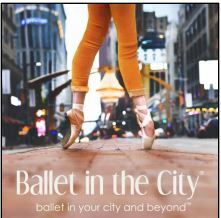 Saratoga City Ballet welcomes Ballet in the City to our studios, July 15-22, 2018! SCB dancers ages 7 and up can reserve a spot in any of the classes below free of charge. Please note that Master Classes by New York City Ballet dancers are very fast paced. All classes are open on a very limited and also first come, first served basis. Should an SCB student want to reserve a spot in any of these classes, they need to email: info@balletinthecity.org. This can be to hold a spot in any of the classes, for a photo shoot, or for interest in a private lesson. 6:30pm- Culminating Event Downtown Saratoga: An Evening with Ashley Bouder and Friends. Celebrate our last night in Saratoga with NYCB Principal Dancer and Ballet in the City friend Ashley Bouder. Email info@saratogacityballet.com for details! *While every effort will be made to maintain all details, times and dancers are subject to change due to unforeseen circumstances and rehearsal and performance schedules mandated by the New York City Ballet. All participants will be informed by Ballet in the City staff immediately if changes are made. Refunds are not remitted for any changes made to itinerary or dancers other than for Ballet in the City’s cancellation of a class or event.